In the final week of October the annual IEEE eScience conference will take place in Amsterdam, the Netherlands. This will be my first eScience conference, and I look forward to seeing how the eScience community is similar to or different from the digital humanities community. I have submitted a paper applying findings of my PhD research to the development of eScience infrastructures for the humanities. Specifically, my paper discusses the problems of power asymmetry in collaborations, with scholars dependent on infrastructures developers, and of knowledge asymmetry, with scholars lacking the knowledge necessary to influence the practices of infrastructure developers. A first difference between the eScience and DH communities I already observed was in the reviews of my submission, which found my topic of interest but lacking in a (technological) solution to the problem. Unfortunately, I do not have a solution readily available, but I have extended my power relation circle with a possible way out in the development of know-how. Below you can find the abstract for my paper, and the poster I will present at the conference (designed by my wife). Next week the annual DHBenelux conference will take place in Amsterdam, the Netherlands. 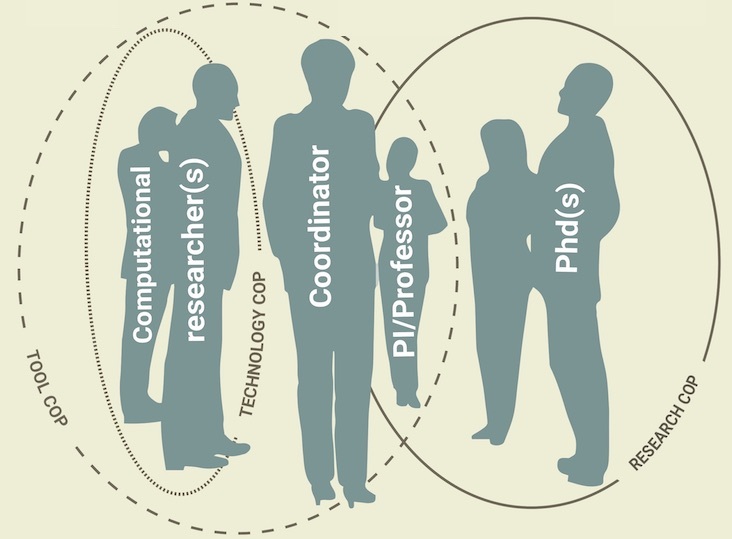 Here I will present the results of my online survey of digital humanities collaborations, focusing on boundary practices and the distance between collaborators. Below you can find the abstract of the paper. For those not able to come, follow the hashtag #dhbenelux. And if you are able to come, see you next week! Last week I was at ECHIC 2018 in Leuven, which focused on infrastructures in the humanities. The conference was small, allowing very integrated discussions in a single-session format, combining participants with backgrounds in the humanities, as well as a large number of librarians. 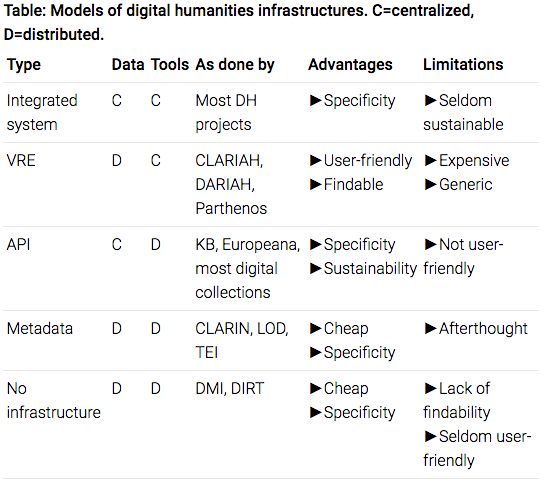 This variety in backgrounds, and the shared concern over infrastructural problems of sustainable data storage and access in itself was already an interesting demonstration of my paper’s point that digital humanities brings infrastructure into focus. 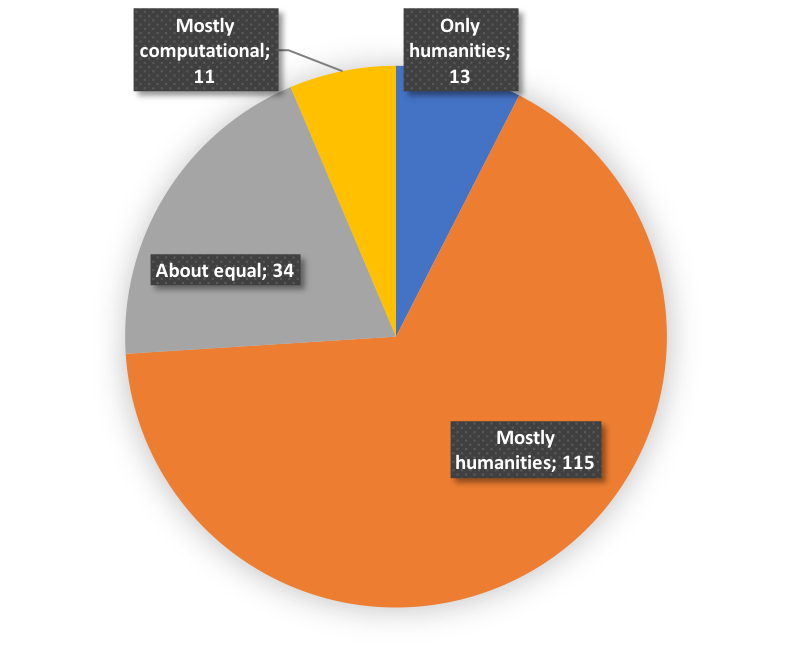 In this blog post, I want to draw a bit of the debate around the main question of the conference: do the humanities require their own research infrastructures? Now that I’m halfway through my third year my supervisors told me it would be better to start focusing on writing chapters rather than conference abstracts. They are of course absolutely right, but then a colleague notified me of the call for papers for ECHIC 2018 (European Conference for the Humanities on behalf of the European Consortium of Humanities Institutes and Centres). This conference will be in Leuven (Belgium) from 4 to 6 April 2018, and will focus on the role of infrastructures in the humanities. As a conference so close to home, and so close to my topic, I could not resist sending in an abstract. In my presentation, I will argue that infrastructuring is the central practice of digital humanities, even though practitioners of digital humanities themselves do not always give as much attention to infrastructures as needed. This is a result of my thinking of the need for a definition of DH, and the work I’m conducting for my PhD. So the below is a slightly more provocative summary of an argument I intend to make in my thesis. I would love to hear your comments and feedback, both good and bad! Next week I will be at The Ends of the Humanities, a conference organised by the University of Luxembourg from 10-13 September 2017, in Belval. This conference aims to “investigate the relationship between the humanities on the one hand, and ethics, cultural and social politics, the education system, the law, the economy, new technologies and other sciences, on the other”. 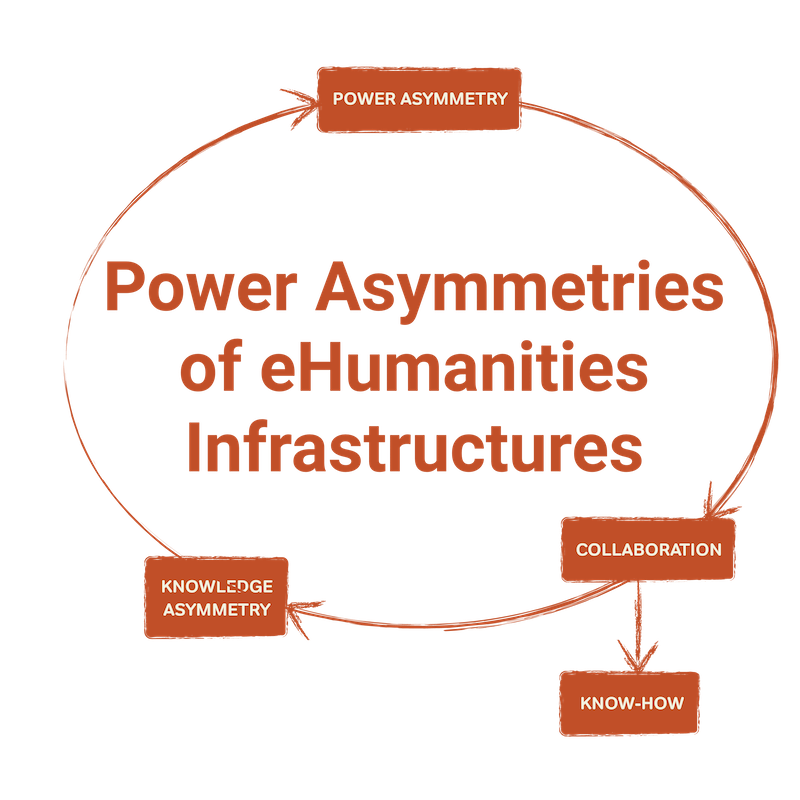 As such it also includes a digital humanities track, to which I submitted a paper about knowledge asymmetry in interdisciplinary collaborations, to discuss how this asymmetry creates a power relation in digital humanities. See below the abstract for my paper. Next week I will be in Montreal for the ADHO DH conference, where I will present a poster with some results from my PhD research. Below you can find the abstract, and below that the poster itself, designed by my wife Lindi. For those not able to come, follow the Twitter hashtag #dh2017, and if you’re able to come I hope to see you somewhere during a coffee break or at my poster presentation! 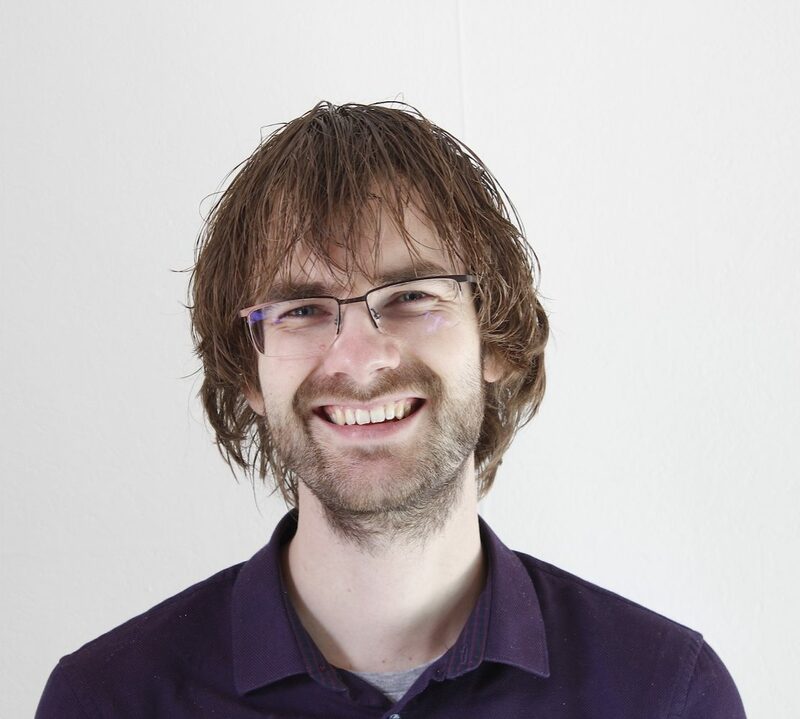 Next week I will be in Utrecht for the fourth DHBenelux conference. This year the conference will include pre-conference workshops, and I signed up for the workshop on tool criticism, a follow-up to the excellent workshop that was held in 2015 (see PDF report here). At the conference I will present a paper showcasing some results of my PhD research into digital history collaborations. Below you can find the abstract of the paper. For those not able to come, follow the hashtag #dhbenelux. And if you are able to come, see you next week! Next week I will be visiting Rome to join the Associazione per l’Informatica Umanistica e le Culture Digitali (AIUCD) conference which will be held from 26-28 January at Sapienza University. See the entire programme here. The topic of the conference is “Il telescopio inverso: big data e distant reading nelle discipline umanistiche”, and as a result Mark Hill and I have formed a panel on big data, distant reading, concept drift, and digital history. In this blogpost I’ll post the abstract of the panel, and my own abstract; if the full proceedings including the abstracts of the other panel members are online I’ll add it to the presentations page. We are excited to have brought together scholars working on concept detection, ambiguity, and methodology of history, so we hope we will get a very nice discussion going. This week I’m at DHBenelux 2016, right here at the University of Luxembourg. I am part of the local organisation of the conference, and will give a tour of the DH Lab which launched its website www.dhlab.lu this week. Moreover, I will present my PhD research in a short paper, see below the abstract for my presentation. To learn more about DHBenelux, see my previous posts on DHBenelux 2016 submissions and DHBenelux submissions 2014-2016. Proudly powered by WordPress Theme: Fictive Child.